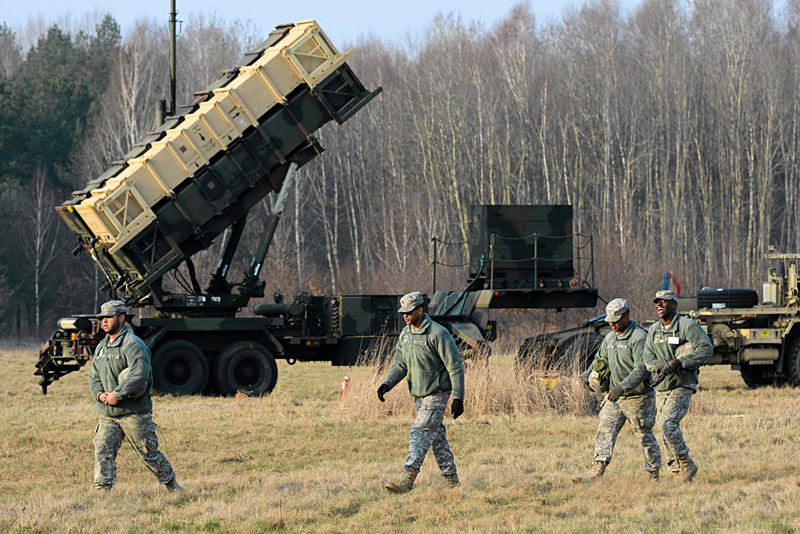 U.S. soldiers walk next to a Patriot missile defence battery during join exercises at the military grouds in Sochaczew, near Warsaw, March 21, 2015. Russia blames the U.S. for taking what it says are destabilizing steps as Washington plans to quadruple spending on arms and hardware to be deployed in Europe in a new display of commitment to its NATO allies. The Russian embassy in the U.S. has said the reported plan by the U.S. administration to quadruple funds for the deployment of military weapons and vehicles to its NATO allies in Europe in 2017 would have a destabilizing effect if implemented. “This is obviously an attempt by the U.S. to escalate tensions without obvious reasons,” said the Russian embassy representative in comments emailed to RBTH. Sources in the U.S. administration have reportedly indicated that Russia is the country to be deterred by the potential buildup. The White House plans to increase the deployment of heavy weapons, vehicles, and other military equipment to its NATO allies in Central and Eastern Europe in 2017, The New York Times reported on Feb. 2. To provide for the deployment, the U.S. administration plans to increase the current level of relevant expenditures exponentially, from $789 million to $3.4 billion, according to several officials interviewed by the newspaper. However, the allocation is likely to be a one-time effort, not a long-term strategy. The funds are likely to be allocated from a supplemental warfare budget and won’t be included into the regular defense budget request, reported Foreign Policy magazine. Unidentified Pentagon officials interviewed by The New York Times named Hungary, Romania, and the Baltic states as possible destinations for the U.S.-supplied equipment. If implemented, the deployment will be a sign of commitment of the U.S. administration to its NATO allies in Europe. Quarrels about the alliance-related responsibilities of the individual member-states have strained relations between the U.S. and its European allies in the past. In 2011, U.S. Defense Secretary Robert M. Gates criticized the U.S.’s NATO allies for their reluctance to share the burden with the U.S. in Libya and Afghanistan. Deteriorating relations with Russia appear to have revitalized Washington’s zeal for NATO. Although it remains unclear whether the Congress approves the budget plan prepared by the administration, it serves as a strong indication of the White House’s commitment to the alliance. The embassy representative told RBTH that the increase in funding, if approved by the U.S. Senate, would be in contradiction to the 1997 NATO-Russia Founding Act. According to the document, both sides agree to cooperate on issues regarding the size of the conventional forces stationed on the territory of Russia and NATO member-states. The reaction from the Russian embassy comes against the background of U.S. officials’ reported confidence that the buildup would not violate the Founding Act. Why is Russia opposed to Montenegro joining NATO? Russia and NATO’s commitments to the 1997 document have been tested repeatedly since 2014, when the Ukraine crisis heightened tensions between the two parties. Nevertheless, both sides appear to regard the treaty as still binding, invoking the document to criticize each other’s actions. Relations between Russia and NATO began deteriorating in 2014 as a result of Russia’s takeover of Crimea and its subsequent backing of pro-autonomy rebels in eastern Ukraine. NATO suspended civilian and military cooperation with Russia in the framework of the NATO-Russia Council (NRC) in April 2014. Russian officials have repeatedly criticized NATO’s policy of eastward enlargement. A new National Security Strategy, approved by President Vladimir Putin on Dec. 31, 2015, listed the buildup of NATO’s power potential and further enlargement of the alliance towards Russian borders among the threats to national security.